I wrote this article for Aviation Magazine of Pakistan Army. They did not consider it worth publishing. So I am sharing it with much wider audience. GPS stands for Global Positioning System and was developed by the US Department of Defence as a worldwide navigation and positioning facility for both military and civilian use. It is a space-based radio-navigation system consisting of 24 satellites and ground support. GPS provides users with accurate information about their position and velocity, as well as the time, anywhere in the world and in all weather conditions. Navigation in three dimensions is the primary function of GPS. Navigation receivers are made for aircraft, ships, ground vehicles, and for hand carrying by individuals. GPS provides specially coded satellite signals that can be processed in a GPS receiver, enabling the receiver to compute position, velocity and time. Good GPS receivers can calculate their position, anywhere on earth, to within one hundred metres and can continuously update their position more than once a second. Of course, various factors, such as terrain and atmospherics can affect the GPS signals. In spite of this however, accuracy of one hundred metres for GPS will commonly be exceeded. Stage 1 – The satellites act as reference points. The nominal GPS Operational Constellation consists of 24 satellites at an altitude of 20,100 km (12,500 mi) and with a period of 12 hours. The satellite orbits repeat almost the same ground track (as the earth turns beneath them) once each day. There are six orbital planes with nominally four satellites in each, equally spaced (60 degrees apart), and inclined at about 55 degrees with respect to the equatorial plane to ensure coverage of Polar Regions. This constellation provides the user with between five and eight satellites visible from any point on the earth. Powered by solar cells, the satellites continuously orient themselves to point their solar panels toward the sun and their antennas toward the earth. Each satellite contains four atomic clocks. The orbital motion of each one is monitored by the Master Control facility located at Schriever Air Force Base (formerly Falcon AFB) in Colorado. The Master Control station computes precise orbital data (ephemeris) and clock corrections for each satellite. It uploads ephemeris and clock data to the satellites. The satellites then send subsets of the orbital ephemeris data to GPS receivers over radio signals. The control segment also ensures that the GPS satellite orbits and clocks remain within acceptable limits. These precise positions and data form the basis for all GPS calculations. Stage 2 – The signal travel time gives distance information. GPS satellites carry atomic clocks that provide extremely accurate time. The time information is placed in the codes broadcast by the satellite so that a receiver can continuously determine the time the signal was broadcast. The signal contains data that a receiver uses to compute the locations of the satellites and to make other adjustments needed for accurate positioning. The receiver uses the time difference between the time of signal reception and the broadcast time to compute the distance, or range, from the receiver to the satellite. The receiver must account for propagation delays, or decreases in the signal’s speed caused by the atmosphere. To calculate the distance between itself and any given satellite the receiver multiplies the travel time by the speed of light. This principal is fundamental to GPS. Stage 3 – Three distances gives the position. Once stages 1 and 2 have been accomplished we now have distance information to a number of satellites the locations of which we know with great precision. From this data, the receiver triangulates an exact position. Three satellites are needed to determine latitude and longitude, while a fourth satellite is necessary to determine altitude. An atomic clock synchronized to GPS is required in order to compute ranges from these three signals. However, by taking a measurement from a fourth satellite, the receiver avoids the need for an atomic clock. Thus, the receiver uses four satellites to compute latitude, longitude, altitude, and time. Let’s assume that the receiver determines that it is 20,000km from a particular satellite. This means that the receiver could be anywhere on an imaginary sphere with the satellite as its centre. If it also determines that it is 25,000km from a second satellite this narrows its location down even further. The only location in space where it can be both 20,000km from the first satellite and 25,000km from the second is where these two spheres intersect. That intersection is a circle of points. 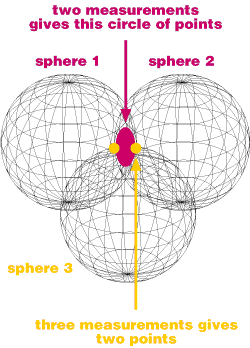 A third measurement adds another sphere which intersects the circle formed by the first two. This intersection occurs at two points, and so, with these three measurements, the GPS receiver has narrowed down its location to just two points in the entire universe. A fourth measurement will intersect exactly with one of the two points. In practice, however, you may not need this fourth measurement as one of the two points will normally be located thousands of kilometres out into space, and therefore is unlikely to be your position! However a fourth measurement is used to calculate altitude. It also ensures that the receiver’s clock is truly synchronised with universal time. Although this example demonstrates the use of four satellites, many receivers are capable of tracking more than four satellites at a time. In some cases this improves the positional accuracy of the receiver. GPS applications continue to grow in land, sea, air, and space navigation. The ability to enhance safety and to decrease fuel consumption will make GPS an important component of travel in the international airspace system. Airplanes will use GPS for landing at fogbound airports. Automobiles will use GPS as part of intelligent transportation systems. Emerging technologies will enable GPS to determine not only the position of a vehicle but also its altitude. I read your article which is a good introduction to GPS. However, there is one concept that is not accurately mentioned. It is true that we need signals from at least four satellites to determine our position but the signal from fourth satellite is not used to compute the altitude but it is used to compute the GPS receiver clock offset (from GPS time). So in summary, the signal from three satellites give us our approximate position (latitude, longitude and altitude) but is it not useful because of the receiver clock offset which introduces huge error. The fourth satellite is used to eliminate the clock offset. When we have the signal from at least four satellites, we can formulate four equations (of ranges from satellite to receiver) and we have four unknowns (latitude, longitude, altitude and clock offset). We then solve them simultaneously.. When we have more then four satellite signals, we solve them either using least squares method or we can employ Kalman filter. thanks sir to gave founctional idea of GPS. Its greatly help me to prepare for 6th semester. I take some parts of your articles to prepare a note on GPS funtion. Gives some articals on ‘Geographical data acquisition techniques’ pls sir.